I knew Cobo Arena was a throwback place, but I had no idea. The folks from across the pond in the U.K. are transforming Cobo into prehistoric Earth, thanks to their "Walking with Dinosaurs" show, playing downtown now thru Sunday. I managed to get to opening night last night with my 16-year-old daughter while mom sat home. The good people at Olympia Entertainment were only able to provide me with two review tickets for opening night, not three, but it's still much appreciated. Especially since they put on such a fantastic show. "Walking" is a 90-minute romp through the hundreds of millions of years when dinosaurs roamed this planet. The show is narrated by a modern day "paleontologist" who, in full gear, guides you through the various stages of the dinosaurs' existence. He's on stage with wireless mike/headset, energetically explaining what it is that you're experiencing. And it's quite a sight. If I was Charlie Sheen, and I was allowed to start making phone calls again, I'd place one to Robert Downey, Jr. The actor Sheen is in trouble again. With a girl, again. And this time it's a tad serious. Charlie was arrested on Christmas Day due to a domestic disturbance, and there are reports that a knife was involved. The alleged victim is thought to be Sheen's wife, Brooke Mueller, though that's not been confirmed. The star of the hit CBS television sitcom "Two and a Half Men" was arrested Friday in the ski resort of Aspen, Colorado, on suspicion of second-degree assault and menacing---both felony offenses---and a misdemeanor count of criminal mischief. The celebrity gossip website TMZ.comis reporting that Mueller was drunk at the time, and that she initially had told police that Sheen threatened her with a knife but later recanted much of her story. John Cherry is too big to be lugged around by coattails. He needs to make the trek on his own. Cherry holds the position of Lieutenant Governor of Michigan, which is like being Vice President of the United States, only much, much worse. You could join the Witness Protection Program and have more notoriety. Yet from this role, Cherry hopes to be governor. He aims to follow his boss, Jenny Granholm, into the big chair in Lansing. There are naysayers. Skeptics. Derisive comments are being made. And that's from within his own party. There are serious concerns within the Democratic camp whether Cherry is a strong enough candidate to fend off the higher profile Republicans who are about to duke it out for the GOP nomination, come next November. Those concerns are well-founded, me thinks. But don't come crying to me. I made a perfectly good suggestiona couple months or so ago, but heaven forbid anyone listen. Yet all might not be lost. I don't take in late night television too much anymore, which actually follows a pattern I have throughout the rest of the day. If it's not sports, or a special about the JFK assassination, I pretty much don't watch it. But I happened upon the David Letterman show a few years ago---I remember this distinctly---and I was taken by the bubbly, perky young woman chatting up Dave to the audience's, and Dave's, bemusement. She was breezy without appearing loaded. Engaging without being ditzy. She just seemed like a lot of fun; there was nothing bimbo about her. It wasn't very long after that when I caught her in a movie with Ashton Kutcher, a comedy called "Just Married." She was terrific in it. That's how I remember Brittany Murphy. Murphy, who died suddenly at age 32 yesterday in California, wasn't typically mentioned when the discussion turned to America's finest young actors. She had her moments, though. If I didn't have a wife, a daughter, and the need to earn a living, I believe I could survive with two things: a used bookstore, and a bathroom. And maybe a chair. But don't go searching for one on my account. I have a thing for used bookstores. Seriously. Some folks, when they arrive in a new town, seek out a cool bar or a trendy restaurant. Or a copy of USA Today. I go looking for the nearest used bookstore. Oh, I've done that -- so don't go calling me a liar. I've done it in St. Louis, New York, and Chicago. And I'd do it in Peoria and Fort Myers and Altoona, if I ever found myself in those burgs. It's daycare for me. If you ever need to ditch me while you go off with other, more exciting people -- like, say, for a week or two -- then simply drop me at the steps of the nearest used bookstore and have yourself a great time in my absence. The Magic Kingdom got a little less magical. Roy Disney is dead. Roy, the nephew of Walt---and avid competitive sailor---the brilliant leader of Disney's Animation Department, is gone at age 79, from cancer. For over 56 years, Roy was associated with the company empire that his father, Roy Sr., and Uncle Walt built. But for the past year, Roy Jr. battled stomach cancer. "As head of Disney Animation, Roy helped to guide the studio to a new golden age of animation with an unprecedented string of artistic and box office successes that included 'The Little Mermaid,' 'Beauty and the Beast,' 'Aladdin' and 'The Lion King,' " the company said. There are some companies whose family name will forever resonate. Maybe none more so than Disney, which began way back in 1923. Today is the boss's birthday. I think I'll get him a new chewy. The boss is six years old today, weighs 19 pounds, and rules with an iron paw. He's our Jack Russell Terrier, Scamp, and I've resisted writing about him until today because his head is big enough as it is. 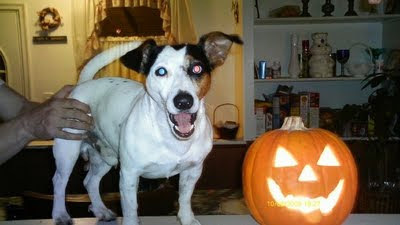 But it's Scamp's sixth birthday today, so why not toss him a bone---pun intended. Scamp rules the house because whatever he wants, he gets. This includes walks when he wants a walk, treats when he wants a treat, food when he wants food, play fetch when he wants to play fetch, and even our bed, when he wants that---which is nightly. He also helps himself to towels off the rack to roll around in, and guards our yard zealously against squirrels and birds. He packs, pound for little pound, more of a wallop than a Great Dane. But he rules because we let him, and we let him because he's so damn cute. And somehow, he must know it, for he uses his cuteness against us, like some sort of force field. A few seconds went by after the first bite. Nothing. I tried another. Still no reaction. I kept eating. My mother, normally sound of mind, waylaid me about a month back, while I was enjoying dinner at her house with my wife and daughter. "Sarah Palin just might come back," she said, or something to that effect. I nearly choked on my corned beef. I made sure we were talking about the same Sarah Palin. It was confirmed. It wasn't April Fool's Day. A "Candid Camera" crew didn't burst in. Mom wasn't, that I knew of, running a fever. Mom's no more Republican than I am, which is about as un-Republican as the Clintons. So this wasn't some partisan pipe dream. She just thinks that ole Sarah has a legitimate chance to rise from the ashes of her failed VP bid in 2008 and land on top of the GOP ticket in 2012. Well, I tell ya---it would be a first.